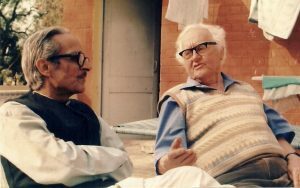 Ralph Russell (1918-2008) was widely regarded as the leading western Urdu scholar and translator. I learnt Urdu from him, and for the last 26 years of his life we worked closely together. I edited many of his books for publication and I am now his literary executor. I work with publishers to keep his books in print and to bring out new editions. His work has an appreciative audience in India, Pakistan and wherever Urdu speakers have settled, but also makes Urdu poetry accessible to people who know no Urdu. 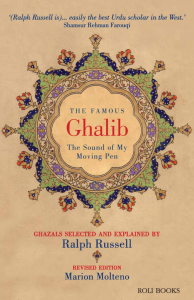 Ralph is best known for his work on the great 19th century poet, Ghalib. The Famous Ghalib: The Sound of My Moving Pen introduces Ghalib’s poetry to readers who don’t know Urdu. The new edition brings together his writing on Ghalib and the ghazal over many years. 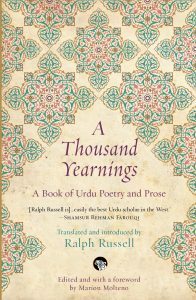 – a new edition of Ralph’s translations, a personal selection from two centuries of Urdu literature – stories, essays, anecdotes, poetry, and extracts from an early novel. With a new introduction by me about his special contribution to Urdu literature studies. Throughout his life Ralph wrote reflections on his personal , political and scholarly experience, which formed the basis of his autobiography. Together we produced the 1st 2 parts, Findings Keepings and Losses Gains. Right up until his death he was putting together materials for me to use to complete the story. 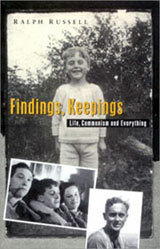 To find out more about this and what it will cover, see: Ralph Russell: auto/biography. Ralph had a huge impact on generations of students, both in SOAS (the School of Oriental & African Studies, University of London), and in through courses he pioneered in the wider community in the UK. For more information, see Urdu language teaching.